most summiters should allow 10-14 hours roundtrip for the climb. In this region, Silvertip Mountain is a regionally significant and prominent peak. During 1859, topographer Henry Custer drew a sketch for the Boundary Survey that gave the name “East Skagit Mountain” to the peak. However, the name “Nuk-a-lah-woom Mountain” was shown on a Series-68 manuscript for that same Boundary Survey. 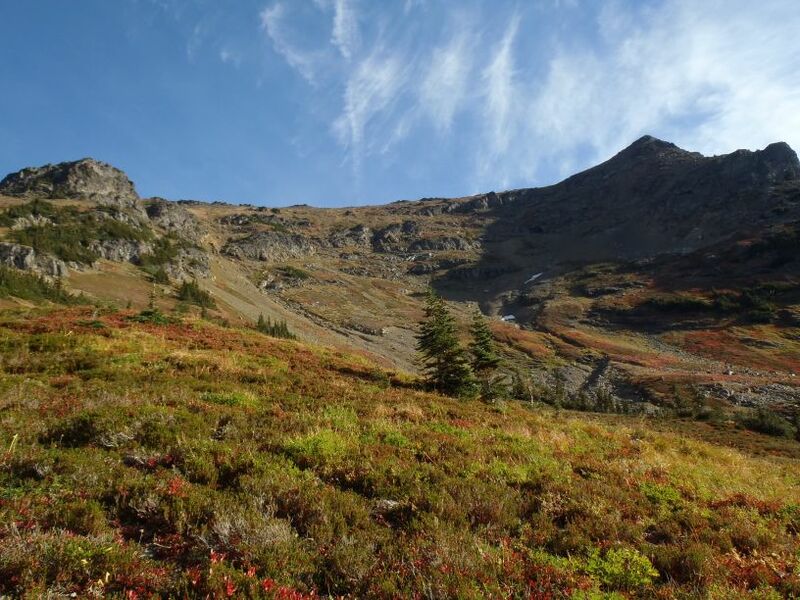 Eventually, the name “Silvertip Mountain” was given to the peak as a reference to the peak’s upper elevations having snowpack for most, if not all, of each year even while surrounding peaks and mountain ranges have long-since thawed-out. Silvertip Mountain from southwest ridge. 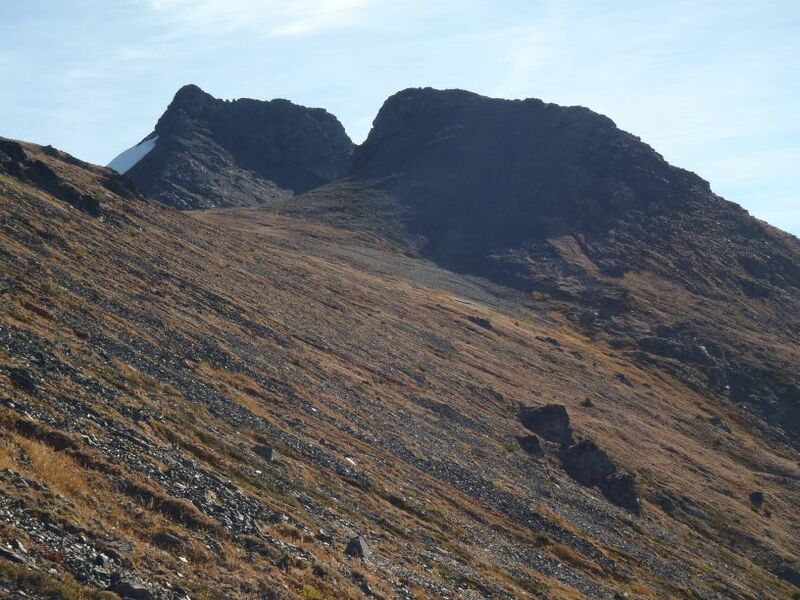 Silvertip Mountain has appeal to multiple types of peakbaggers but especially people interested in topographic prominence. 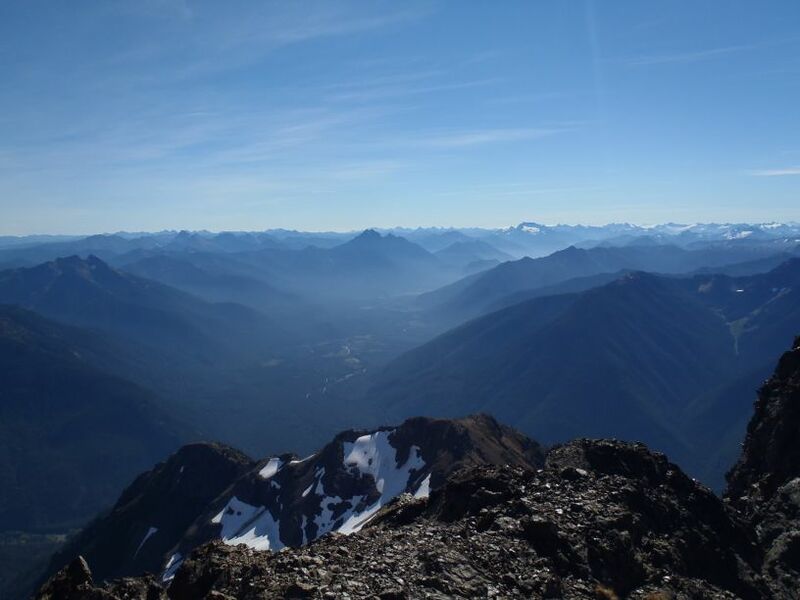 With a clean prominence of 6089 feet, Silvertip Mountain has the distinction of being the most prominent non-volcanic peak in the Cascade Mountain Range. Most peakbaggers with general knowledge of prominence might assume that distinction belongs to Mount Stuart, located in neighboring Washington State (USA), but that peak only has 5354 feet of clean prominence. 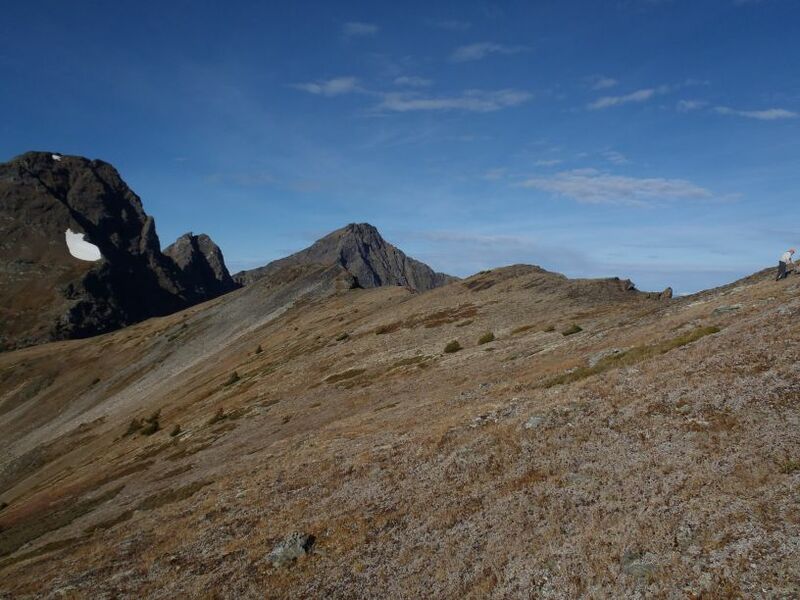 Another key distinction of Silvertip Mountain is that it is the farthest south of all Canadian ultra-prominence peaks, located only approximately 10 miles from the contiguous USA. In fact, if the USA-Canada border was located farther north by that distance, Silvertip Mountain would be the sixth-most prominent peak in Washington and the 25th-most prominent peak in the contiguous USA. 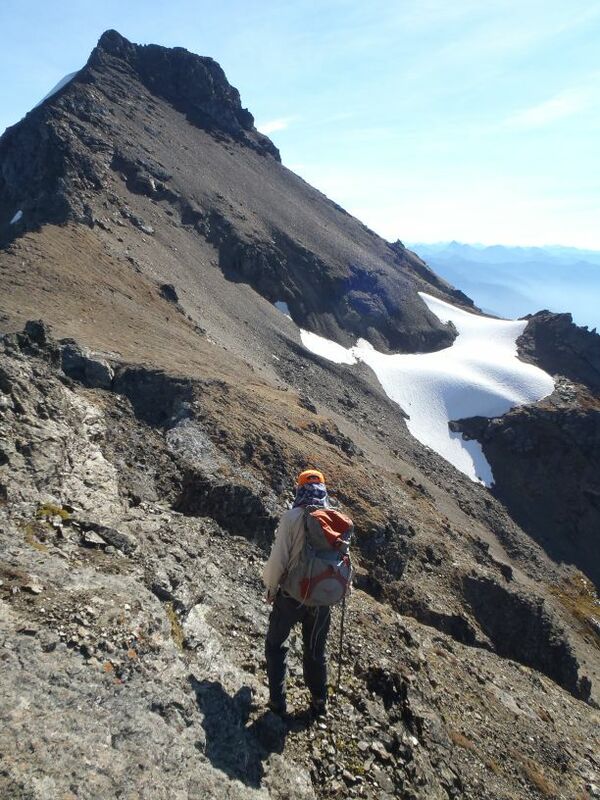 In reality, and perhaps astoundingly, Silvertip Mountain is only the 35th-most prominent peak in British Columbia. I was originally interested in visiting Silvertip Mountain as a result of its name but more so later because of its prominence. I initiated planning and gathered some interested climbers for an attempt of the peak during mid-June 2011 via a north approach which had been the standard approach in the past. Unfortunately, a favorable weather window became available during dates which I already had prior commitments. 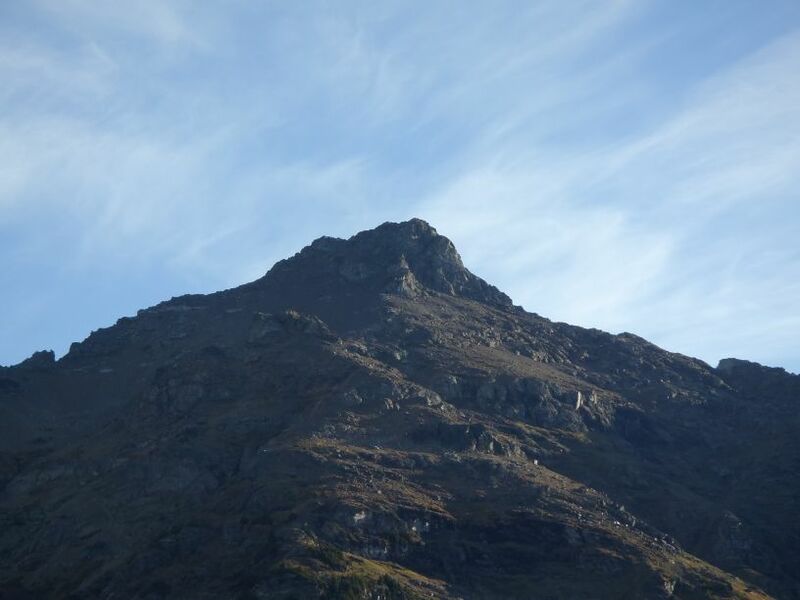 The rest of the group still attempted the peak via the north approach; the trip ended as a failed attempt and provided clues as to the difficulties of the approach. 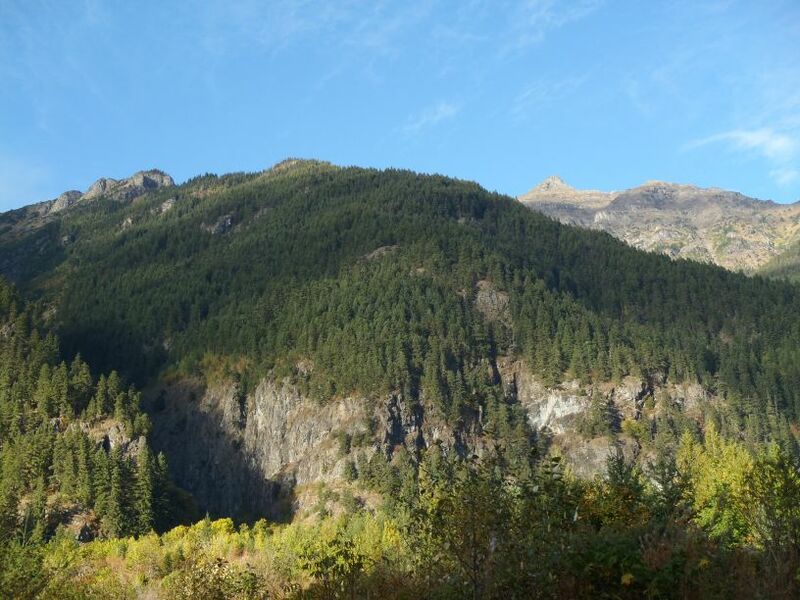 The original access road had become vastly overgrown with slide alder, the lower northern slopes of the peak were full of very loose and potentially treacherous rocks, and the upper slopes of the peak were encased in potentially avalanche-prone terrain and icy rocks. Whereas more snow would have been favorable down low, it became a hindrance up high with the conditions encountered. Similarly, little-to-no snow down low was not favorable but would have been more advantageous up high. A couple of people (one of whom was in the original group) were successful via the north approach nearly two months later but after hearing the horror stories from both trips I began researching other possible approaches. Martin was one of the original people who expressed interest in visiting the peak, and he was part of the failed June 2011 attempt. One year later, during late September 2012, he was available to make an attempt with me via a southern approach we had each learned about. Despite the northern approach being shorter and having less elevation gain, the southern approach was considered less technically difficult and more straightforward. I had also verified from several Canadians that due to the potentially overgrown and unstable terrain on the northern approach for Silvertip Mountain it was no longer a preferred option; local climbers had started considering the southern approach as the recommended and standard approach. With a favorable early Autumn weather window, Martin and I drove up to British Columbia on a Saturday evening. We were pleasantly surprised to find the “trailhead” only 3.5 hours from Seattle. We car-camped and then started hiking early on Sunday morning. As is the case with many high elevation Canadian mountains, we found September to be a good month to visit Silvertip Mountain due to a favorable weather window, no bugs, and very little snowpack along the approach. In contrast, Martin had previously visited the brushy slope near the trailhead during a spring visit and encountered ticks. Other summit parties have reported mosquitoes during summer. In addition, the access spur road leading to the trailhead had a large dip at the beginning of it; the dip might be crossed using a standard passenger vehicle but high clearance would have no difficulties. With that said, a person could park any vehicle near the entrance to the spur road and only need to hike 0.25 mile (0.40 km) to the trailhead. We verified that the approach via the southwest ridge of the peak was fairly straightforward and non-technical. We found only three sections of our route which required extra attention and could be considered as “crux” sections. Our GPS devices were very helpful, too, as the route was obscured a few times during the descent through the lower thick forest where the ridgeline was less defined. 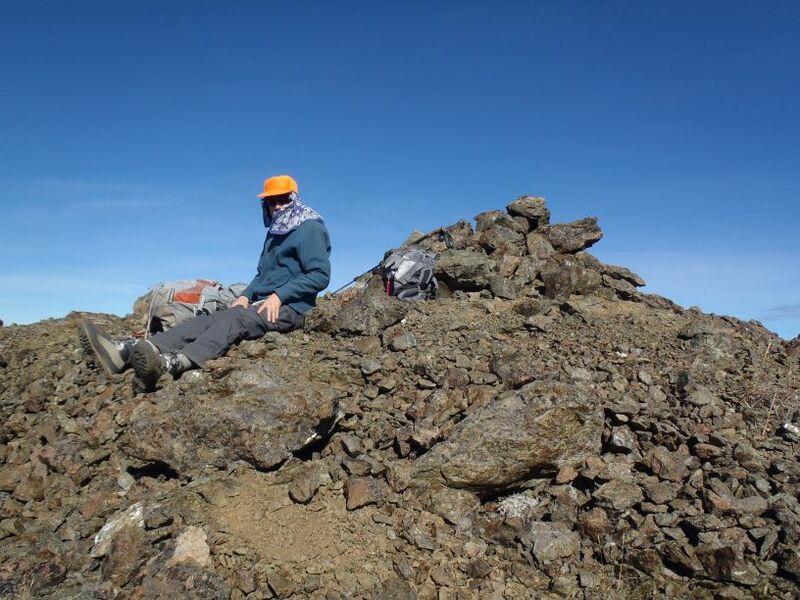 When we reached the summit, I put on some “Silvertips” gear in homage to a major junior hockey team based near my home. The summit is definitely worth the effort, with vast views in every direction including many famous North Cascades peaks. I created a detailed summitpost page for Silvertip Mountain. Other trip reports and information might be found on the ClubTread forum website or peakbagger.com website. 1) From Chilliwack, BC, head east along Highway 1 towards Hope. 2) After approximately 30 miles, take Exit 168 for Flood-Hope Road (immediately prior to Hope). 3) Turn right onto Flood-Hope Road. but eventually becomes decent gravel with some "washboard" areas. 5) After 22.4 miles, turn left onto an unmarked dirt/gravel road. For reference purposes: The Maselpanic Forest Service Road is passed on the right side (south side) of Silver-Skagit Road at 22.0 miles. After passing that road junction, a leftside spur road will be passed 0.2 mile farther east: DO NOT TAKE THAT ROAD. A second leftside spur road, 0.2 mile farther than the first spur road, which has a large dip in the beginning of it, is the correct road. 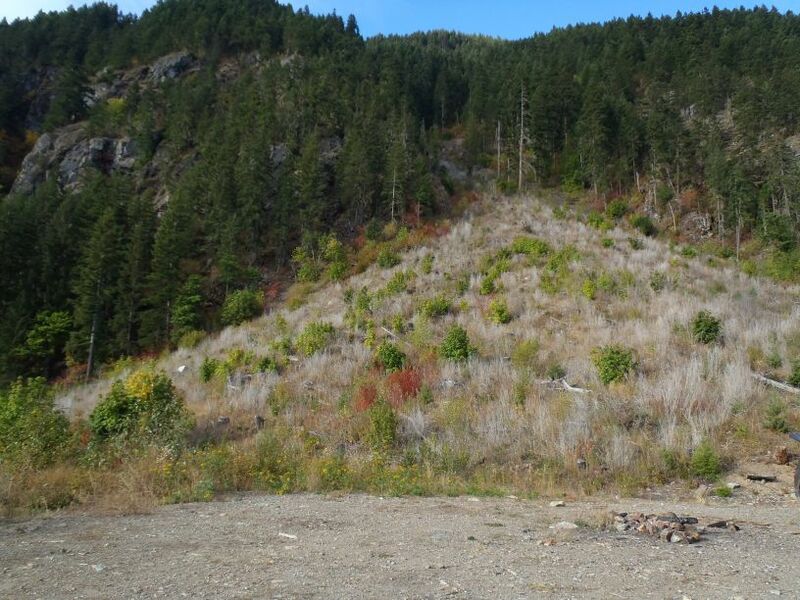 6) The spur road winds for 0.25 mile to a road-end and parking area, at the base of a steep, brushy, fan-shaped slope that is the remnant of a past clearcut. This is the beginning of the southwest ridge route. IMPORTANT: The spur road is currently in good condition and is drivable by most passenger vehicles. However, use extra caution for the initial large dip that occurs at the road junction with Silver-Skagit Road. If the dip is too cumbersome for a vehicle to cross, find a nearby location to park alongside Silver-Skagit Road. Southwest ridge with Silvertip Mountain behind, as seen from Silver-Skagit Road. 1) From the road-end/parking area at 2000 feet (600 m), begin hiking up a large, steep, brushy, fan-shaped slope. This slope was once the site of a clearcut, but is relatively straightforward to traverse. NOTE #1: The general rule-of-thumb is to ascend the slope left-of-center. There might be some hiker-flagging present, marking upper sections of the path leading up the slope. NOTE #2: This lower slope is prone to ticks, mostly during Spring through mid-Summer. Tick season is usually over by late summer, but checking for ticks is always advised regardless of the ascent timeframe. 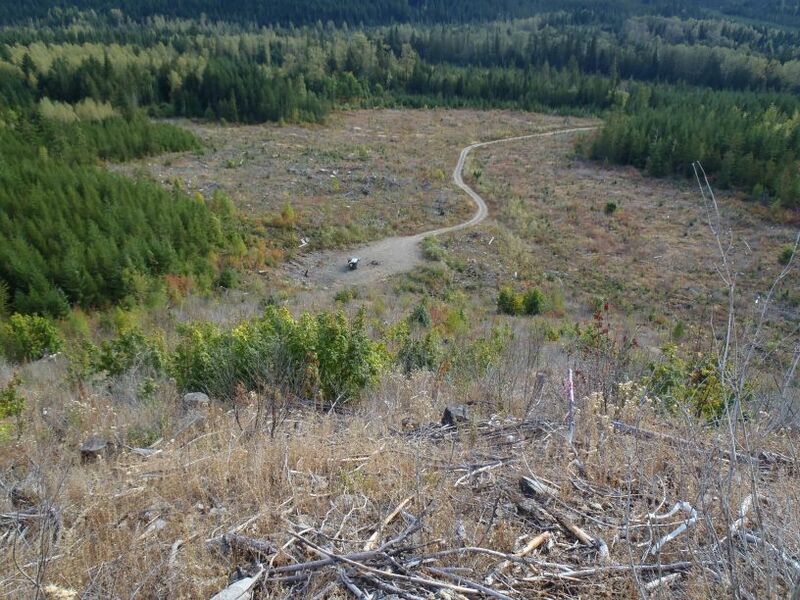 Fan-shaped former clearcut slope at climb's start. Spur road and parking area from near top of fan-shaped former clearcut slope. 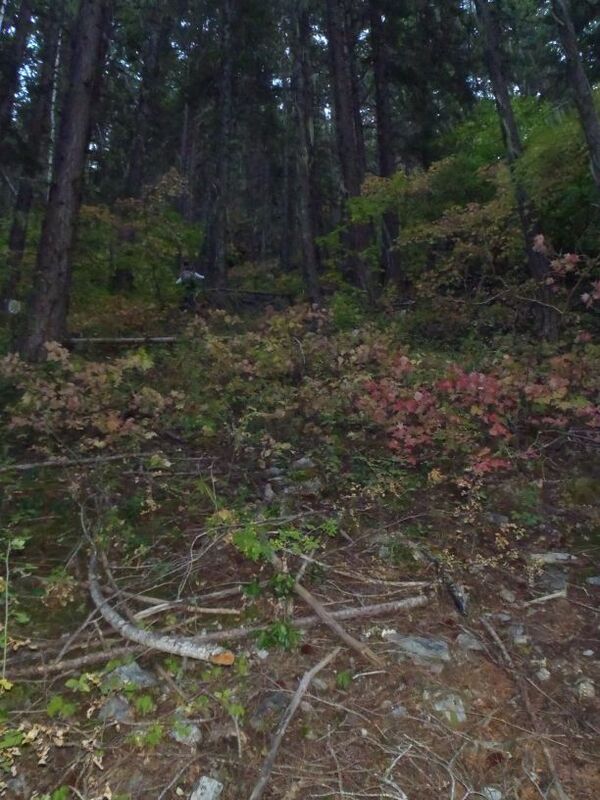 2) At approximately 2700 feet (820 m), the slope winds up to the left (west) and enters steep forest. 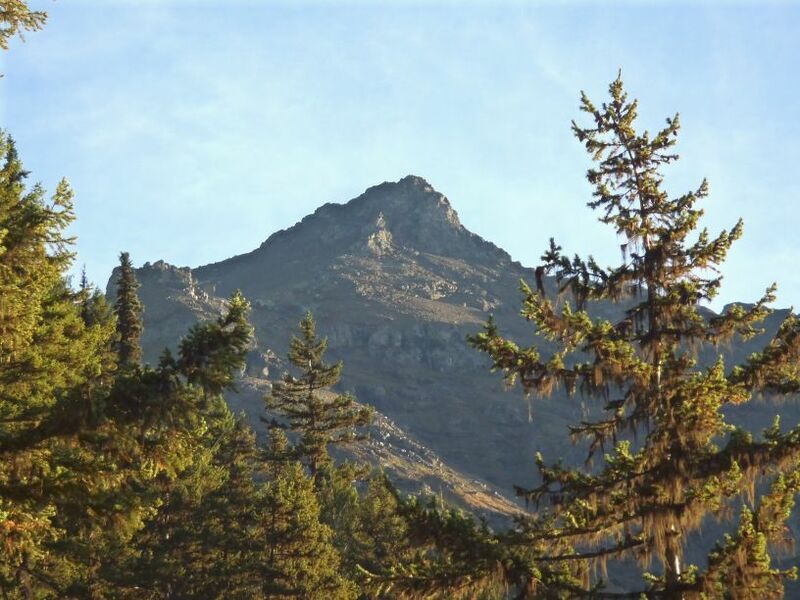 Ascending hikers can either follow the fan-shaped slope all the way to its upper end (where a path can be located), or begin heading up through steep western forested slopes. OPTION #1: Much of the lower southwest ridge is cliffy on all sides, so reaching the ridgetop can be cumbersome if off-route. The preferred location to ascend to the ridgetop is the locally-nicknamed “Steep Dirt Step” which is a very steep, narrow dirt slope. This is the option most people have used, although other nearby climbing options might be possible (see below). Some people find this location easily, and some people do not. Some veggie belays might be necessary at this location, as a slip on this slope could have disasterous consequences. Looking up at “Steep Dirt Step”. Martin climbing in middle of “Steep Dirt Step”. OPTION #2: It might be possible to scramble up rocky cliffs and/or gullies near this area, although finding the proper place to do so might be difficult. It is recommended to use caution and mark your route on a GPS device. OPTION #3: It is also possible to continue ascending along the east side of the southwest ridge, below the cliffs, until bypassing the cliffy areas. However, this possibility is extremely brushy, can lead people off-route, and is not advised. 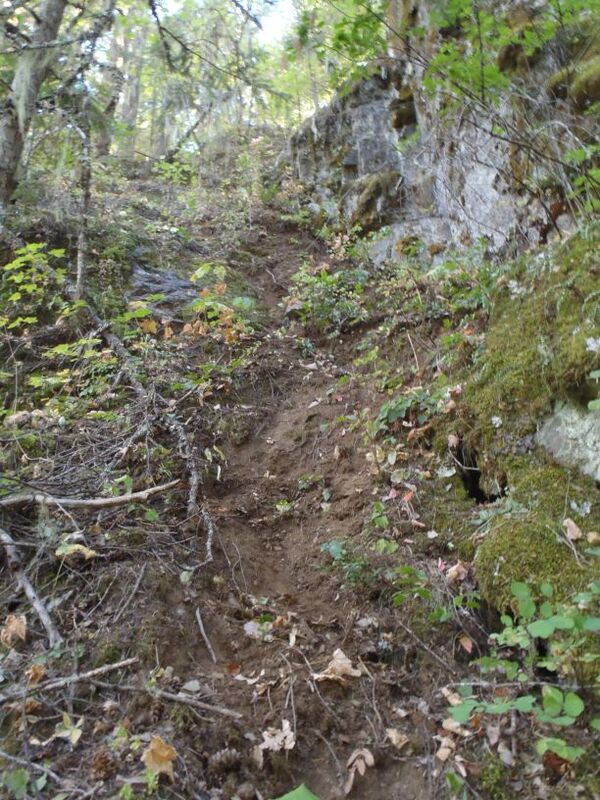 4) Once above the “Steep Dirt Step” (or another option), begin ascending the ridgetop through steep forested terrain. A path might go in and out of visibility, but the general rule-of-thumb is to continue up along the ridgetop. 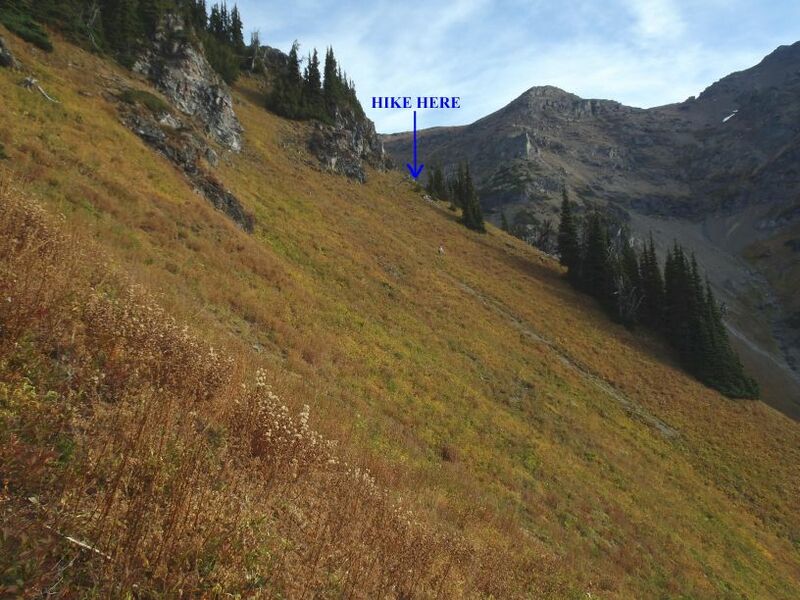 IMPORTANT: Although ascending the ridgeline is straightforward using the “just keep going up” philosophy, it is definitely possible to get off-route while descending the ridge on the return trip. It is recommended to have and use a GPS device as a safety method to correctly follow the same route in both directions. Martin ascends steep forested terrain. 5) At approximately 4800 feet (1460 m), the first of several small clearings is passed which offers views of Silvertip Mountain. First view of Silvertip Mountain from southwest ridge. 6) At approximately 5300 feet (1620 m), a knife-edge section is reached which offers good views of Mount Rideout. 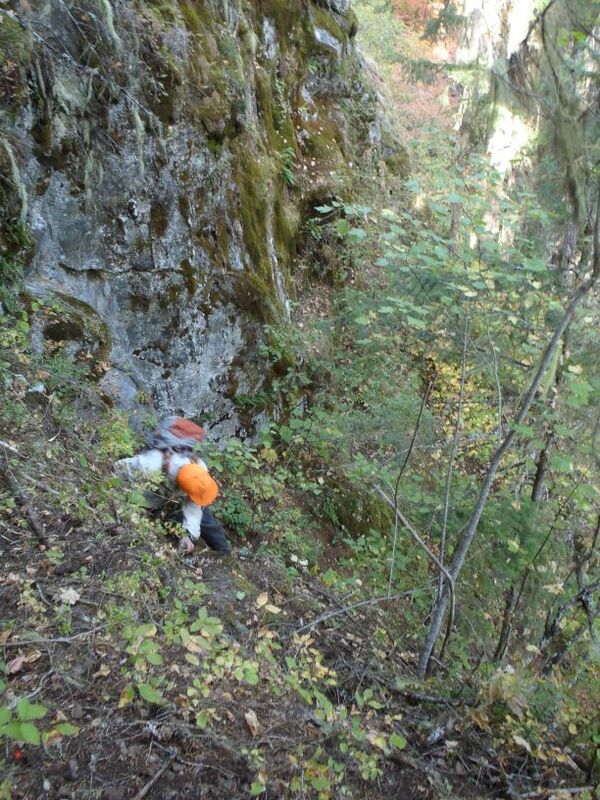 After this area, summiters will reach a small rock rib which needs to be bypassed by side-traversing its east slopes. Several small rock ribs are also bypassed or ascended near this area. 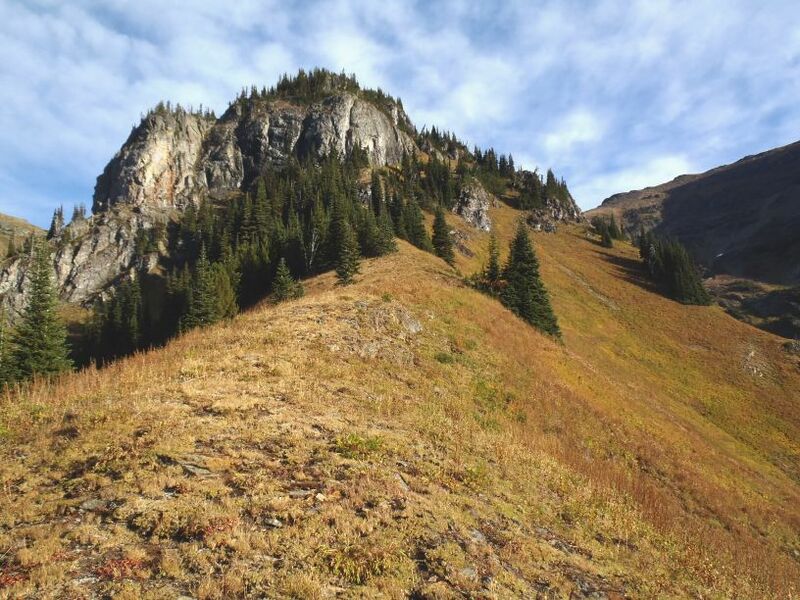 7) At approximately 5900 feet (1800 m), the forest ends and the southwest ridge becomes a long meadow ridge leading towards a massive rocky bluff. Ridge terrain opens and approaches rocky bluff. 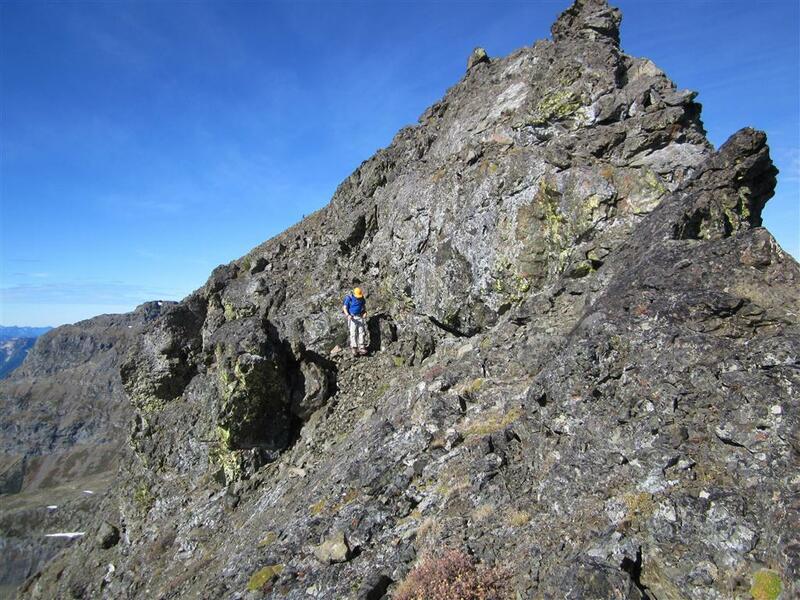 At approximately 6000 feet (1830 m), slightly drop down the east side of the southwest ridge and begin side-traversing steep meadow slopes around the rocky bluff. Continue side-traversing towards a small grove of evergreen trees located near the center of the slope-corner; an old goat path can be temporarily found near this location. Martin side-traverses towards central grove of evergreen trees located at slope-corner. 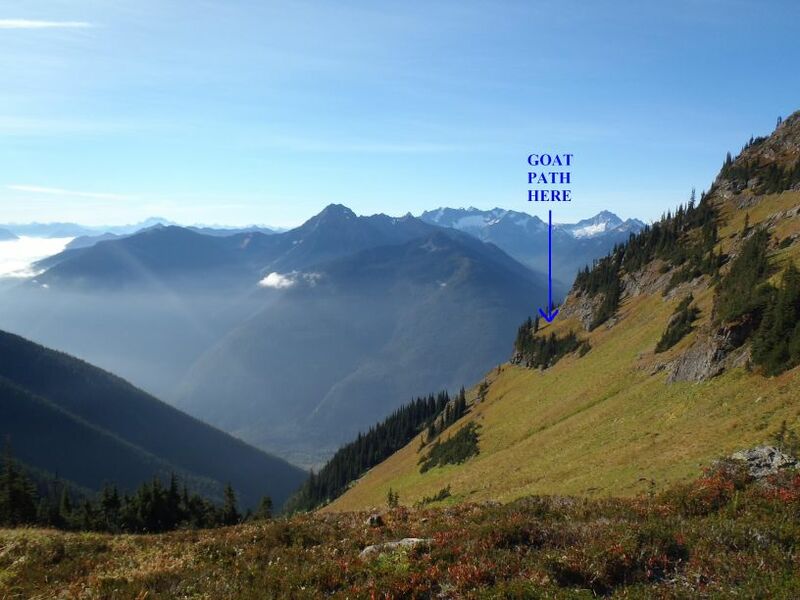 9) Follow the goat path (or side-traverse) around the rocky bluff until reaching the large gully/basin on the east side of the rocky bluff. Looking back at east side of rocky bluff, where goat path is located. 10) Continue angle-traversing towards the large gully/basin, until reaching gentler-angled slopes at the southern base of the upper west ridge of Silvertip Mountain. If wanting to camp overnight along the approach, this route section might be the best location to do so. 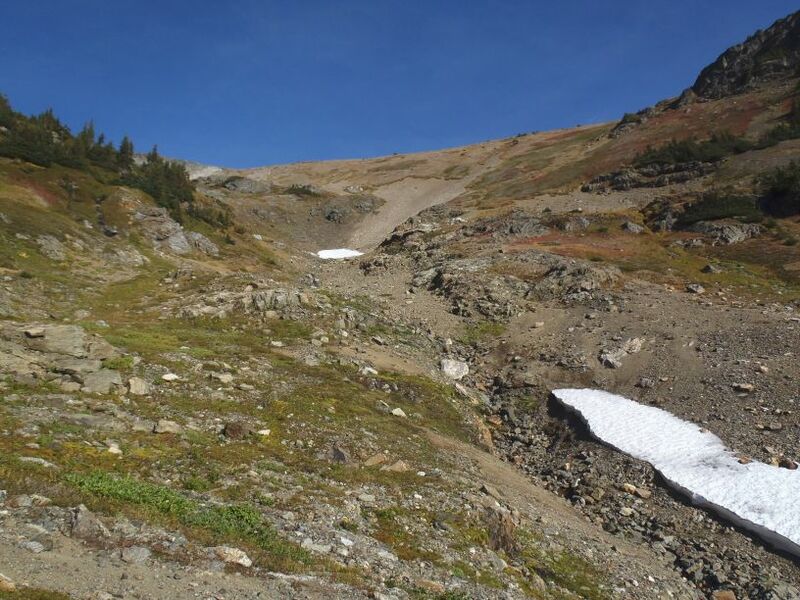 IMPORTANT: The upper areas of this large gully have snow-fed streams at approximately 6300 feet (1920 m) which offer the only natural water sources (outside of snowpack) along the route. 11) Begin heading north up steep rocky meadow slopes until reaching the top of the west ridge at approximately 7000 feet (2130 m). Ascending large gully leading to top of west ridge. 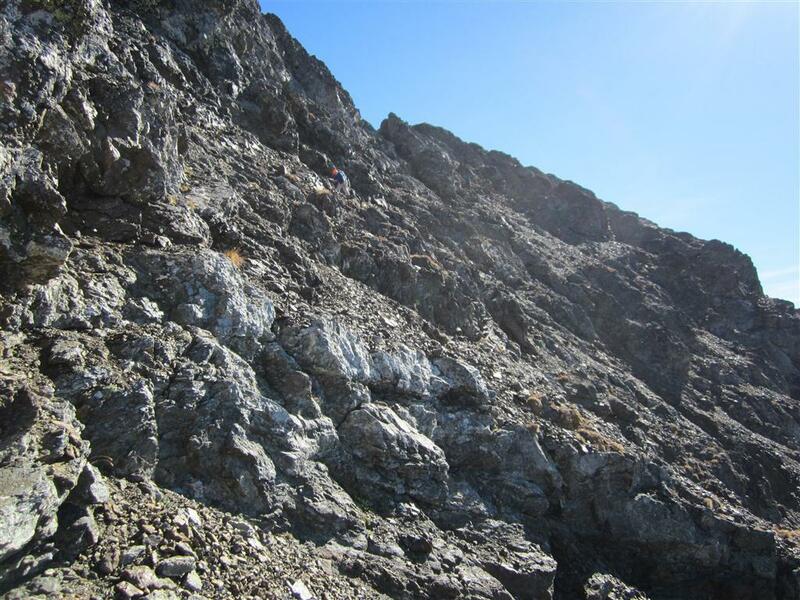 12) Follow the west ridge of Silvertip Mountain eastward along the ridgetop until near the top of the rocky false summit. Martin (far-right) follows west ridge of Silvertip Mountain. Following west ridge towards false summit. The true summit of Silvertip Mountain is in left background. Once near the top of the false summit, begin to drop down onto rocky ledges and scramble around the south side of the false summit block. The handholds and footholds in the rock are of Class 2 quality but the exposure is generally low difficulty Class 3 if on-route. Martin hikes along south side of false summit. Craig downclimbs around south side of false summit. Photo courtesy of Martin Shetter. 14) From the saddle between the false summit and true summit, continue heading eastward up the true summit hill. The ascent of the summit hill is mostly steep scree and dirt. Extra caution is required for the final summit slopes, due to the steep-but-loose terrain and an extended amount of side-traversing necessary. 15) When nearing the final summit block, ascend in the direction of a small notch on the right side (south side) of the summit. 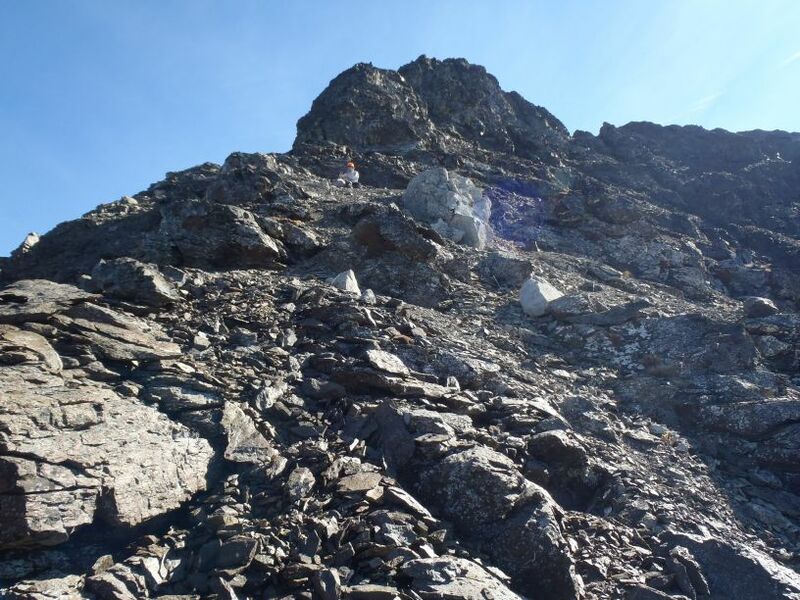 There is a final hidden gully leading up loose scree from the notch to the summit at 8517 feet (2596 m). ALTERNATE OPTION: It is possible to scramble (Class 3-4) solid rock to the summit starting from the left side of the notch. Martin takes a break halfway up the true summit hill. Summiters should aim for the small notch right (south) of the summit block. Craig descends from notch near summit. Photo courtesy of Martin Shetter. 16) The summit is open and rocky. There is an excellent 360-degree view. Far-ranging southeast view from summit. Martin takes a well deserved summit break. 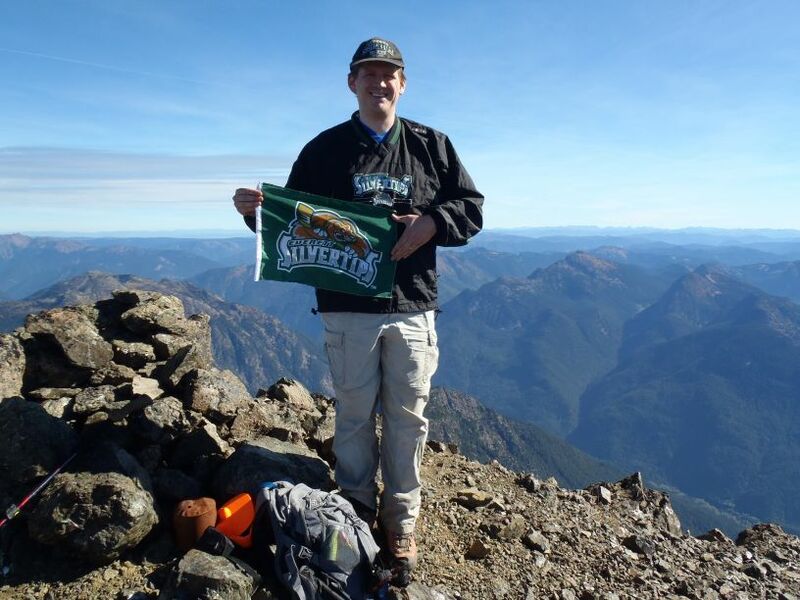 Craig shows “Silvertips” pride atop Silvertip Mountain. Looking back at east side of rocky bluff with goat path indicated.